Download the demos and purchase here. There are now three source code ACCDBs with two bonus metro-style databases including one coded for custom ribbon images. 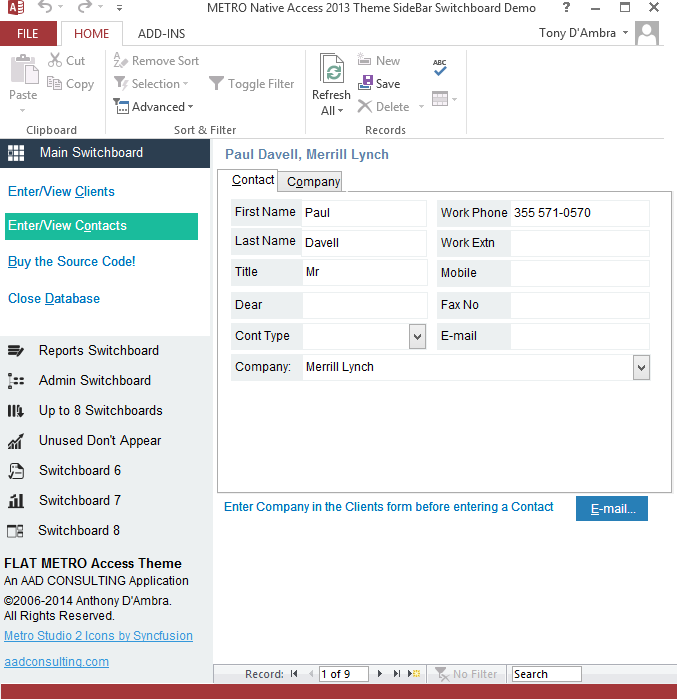 Each database features a space-saving application navigation paradigm that utilizes the flexible Ribbon Bar GUI and tabbed MDI option in Access 2007/2010/2013. Visit aadconsulting.com to buy the three full source code ACCDBs now for only $US49.95. 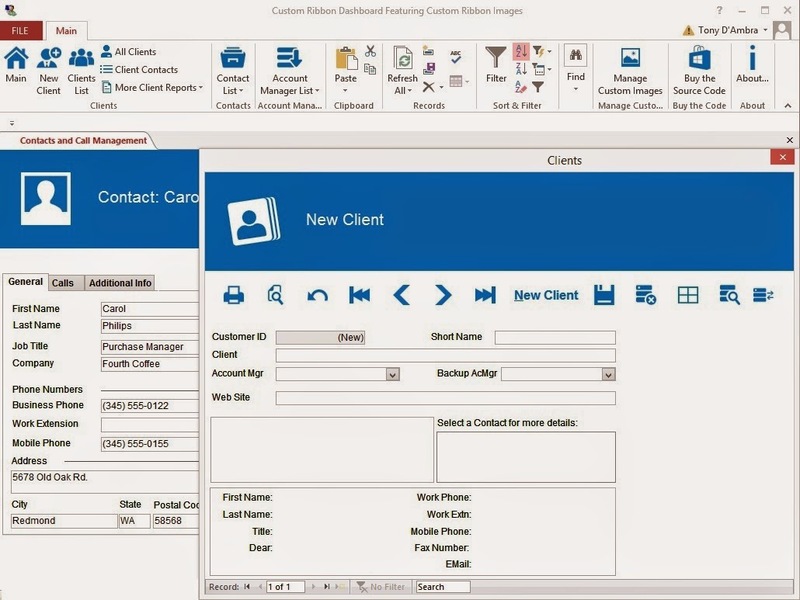 An updated BETA 3 version of my Access Ribbon Builder and Editor for Microsoft© Access is now available for free download. The Builder is a fast and easy way to build and manage Access Custom Ribbons. The update dated 18-Aug-14 supports Access 2007/2010/2013, has a redesigned GUI, and includes bug fixes. All button commands (except the Edit Control button) are now grouped on the LHS of the screen and the msoImage LookUp panel has been moved to the edit control tab. The selected control information box has been made larger to accommodate the data on the more complex controls. Multiple ribbon tabs are now fully supported. You will need to UNINSTALL previous versions/updates before installing this update. Templates... Select a ribbon template from the samples shipped with the Builder. An updated BETA 3 version of my Access Ribbon Builder and Editor for Microsoft© Access is now available for free download. 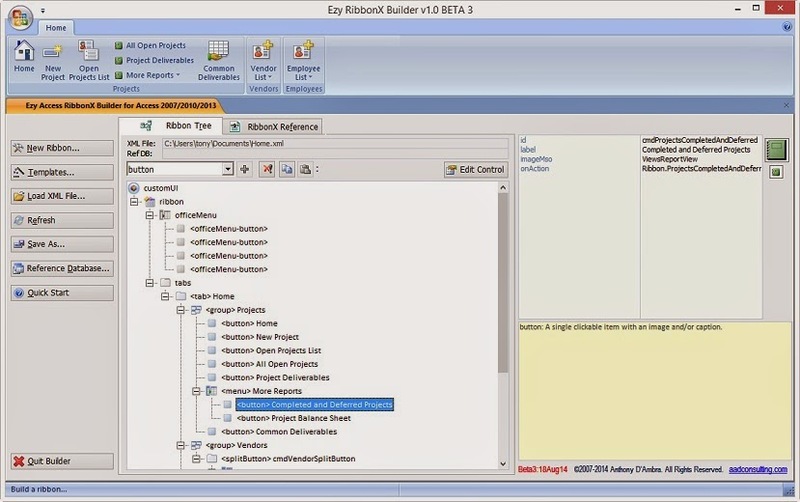 The Builder is a fast and easy way to build and manage Access Custom Ribbons. The update dated 4-Aug-14 supports Access 2013 and includes bug fixes. Download SP1 for Office 2013 here - includes a roll-up of all previous updates. This link from About.com also has direct links to the latest service packs for Office versions 2000, 2002/XP, 2003, 2007, and 2010, as well as Office 2013.